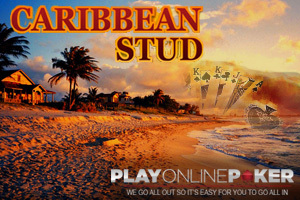 Like normal five-card stud poker, following the ante, Caribbean poker deals five cards to each player as well as five to the dealer with one of their cards face up. Players can choose to play or fold on inspection of their hand as well as the dealer’s show card. If a player chooses to play that hand, they must double their ante – or call – in order to continue, so an original wager of $10 would make for a call of $20 and a total bet of $30. Players can also partake in the progressive jackpot available at most casinos by making a side wager before the hands are dealt. Following the second ante, the dealer reveals their four remaining cards and must have a hand of Ace/King, or a poker hand of a pair or higher to continue. If they do not, the hand if forfeited and the players are paid on the original ante bet and the call is returned. If the dealer’s hand does qualify, the players play their best poker hand against the dealer. There is no draw like in some stud poker games, so often times a pair will hold up just fine against the dealer. The better the poker hand, the higher the payout. So a pair often pays even money while more difficult hands, like a flush or full house can pay upwards of 5-to-1 and 7-to-1 respectively. A royal flush, the most rare poker hand, can cash in at 100-to-1 depending on the casino. If a player chooses to play the progressive jackpot before a hand is dealt, they wager a set amount, usually a dollar. And if they score a high poker hand, they are rewarded with an extra bonus payout. Depending on the casino, jackpot payouts may vary, but often times a flush is worth $50, a full house is $100, four of a kind is $400, a straight flush is worth 10 percent of the collective jackpot, and a royal flush will win the entire progressive jackpot. If you don’t win with one of those select hands, your extra wager is added to the jackpot.